Theresa Franklin grew up in Houston, Texas. After graduation she attended East Texas Baptist College. There she met her husband on a blind date. They married a short time later and moved outside of Beaumont, Texas where they raised their three children. Theresa taught school for 12 years. Students with disabilities won her heart and she became Director of Special Education in an effort to better serve them. She retired in 2010 and began writing children’s books. 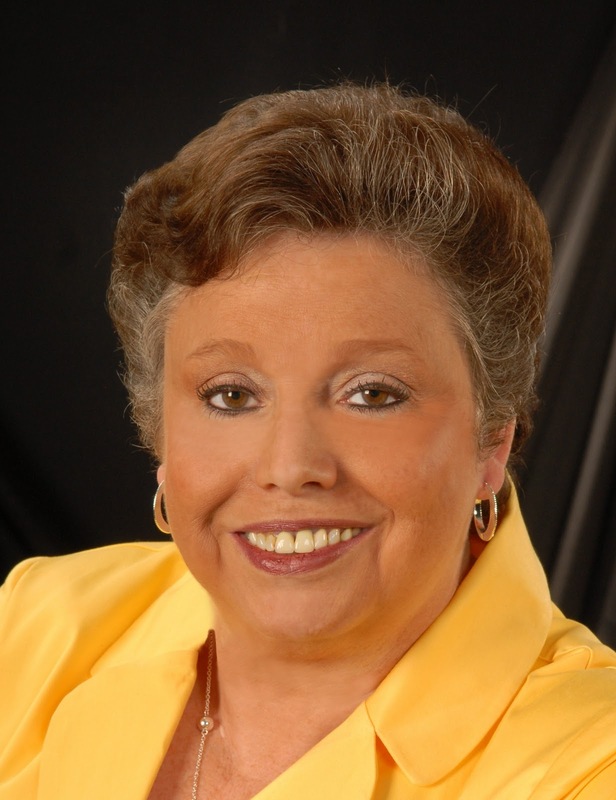 Theresa is the author of children’s books, Don’t Forget Daddy and A Sunny Tomorrow. Her adult books include non-fiction Journey to Fulfillment and fiction Triumph Through Trial. She has written one curriculum guide for the novel Night of the Cossack, a historical fiction for young adults by Tom Blubaugh, titled Night of the Cossack, Lesson Plan. Learn more about Theresa on her blog, and her Facebook page. Join her on Twitter. Have you experienced heartache? Has emotional trauma turned into physical pain? Are you tired of life's setbacks and looking for reassurance from God? Journey to Fulfillment is for you. Through this encouraging and often humorous devotional, author Theresa Franklin will show you how to turn life's impossible stumbling blocks into stepping stones toward a fulfilled life. In Journey to Fulfillment, Theresa chronicles the painful events in her life and how they changed her character and her principles forever. She challenges you to remember your childhood and how events from your past have influenced your today. God uses each milestone as stepping stones to strengthen and prepare you for His service. Learn to achieve your goals by letting the painful events of life strengthen you. And consider what could be or has been accomplished because of these adversities. Consider each person who has gathered strength from you because of the journey God allowed you to travel. 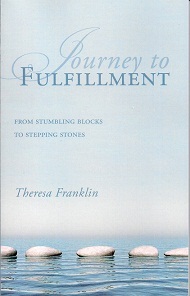 Join author Theresa Franklin in her tender and delightful memoir, Journey to Fulfillment, as she shares her life experiences that have molded her character into the woman God intended her to be. Theresa, honestly and brazenly discusses heartaches, tragedies and triumphs from childhood through adulthood. With an open and compassionate heart, the Author lays bare the adversity she has faced through life to include the loss of her first love to marrying and the challenges one can face in being a wife and a mother, and notably her struggles in teaching special needs children. Throughout all, there has been one constant in her life, the unconditional love of her Savior, Jesus Christ. Theresa Franklin turned childhood darkness, pain and hardship, to profound convictions, insight and style of teaching that shine like diamonds in the rough terrain on which parents and teachers tread. Her writing sings with vivid description of moving episodes, life's patterns and desires. All too familiar to most. And her message resonates with power, so deep, all parents and teachers need to embrace. Journey to Fulfillment is truly a journey not just for educators, but for anyone trying to learn what brings true fulfillment. And those who need to see how joy fills our soul when we use our life and passion and dreams to impact others. The pages in Journey to Fulfillment bring such basic, yet profound insights as this: "... one student was in trouble for a year, one student was in trouble for probably the fourteenth time in two weeks. I stood over his desk and reprimanded him severely. As I listened to my voice and watched his little head hung low, I thought, Theresa, you have to change this. You cannot let this child leave the room feeling bad. I deliberately softened my voice and said, "Now, Daniel." Before I could finish the statement, without raising his head, he said, "I know, I know. You love me because I am me, not because of what I do or say. As long as I am me, you are going to love me. It is my behavior that you do not like. You love me but not my behavior." The lesson in Journey to Fulfillment: true fulfillment and satisfaction comes when we resolve to use our experiences, trials and triumph in our own life to turn another life around. My review follows this press release. Whether you’re downsizing your home or just starting out, professional organizing and decorating author Kathryn Bechen will show you how to create a space where you can live well regardless of the size. Dedicated to helping small space dwellers thrive in their home for over 20 years, Bechen wants everyone to feel proud of their comfortable and welcoming living space regardless of the square footage. 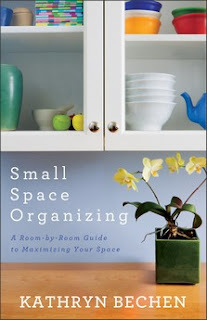 In Small Space Organizing: A Room-by-Room Guide to Maximizing Your Space (Paperback ISBN: 978-0-8007-2028-5, 240 pages, January 2012, $12.99), Bechen compiles 20 years of real life organizational tips and tricks. This ‘small space bible’ will help anyone transform cramped space into a perfectly petite living space as Bechen goes room-by-room giving design and organizational advice as well as taking on the extremely small spaces of studio and basement apartments, loft and high-rise spaces and even tips for RV living. Small Space Organizing will help readers at every stage of life create an inviting home and maximize living. Everyone from the newlyweds struggling to fit all their wedding presents into a small apartment to empty-nesters with years-worth of sentimental possessions moving to a smaller home can benefit from Bechen’s expert advice. Kathryn Bechen is an award-winning professional writer whose articles have appeared in popular national and regional magazines and newspapers. She specializes in lifestyle feature articles and has also published several organizing and decorating e-books. The lifestyle companies she founded, Organized with Ease and Kathryn Bechen Designs, have served clients worldwide. Bechen has organized and decorated 13 personal small space residences together with her husband Steve. They currently live in their favorite small space ever: a 1,200-square-foot high-rise apartment in beautiful San Diego, California. She blogs about timely lifestyle topics at www.KathrynBechenINK.com. Revell, a division of Baker Publishing Group, offers practical books for everyday life. For more information, visit www.RevellBooks.com. After cleaning out my grandparents’ households, then moving my parents and inlaws, I knew I wanted to leave less behind. This book has fantastic tips and spaces for notes, as well as a treasure trove of resources. I live in a big farmhouse now, but it was built in the 1850s—back when you hung your clothes on hooks and kept your couple of pots and crockery on a shelf in the summer kitchen and wouldn’t dream of having a privy in the house! Subsequent remodeling has given me four closets, two bathrooms, electricity and indoor plumbing. The kitchen is still the middle of the house with at least one door on every side, so the cupboards are minimal. I could have used this book when I moved in, even to this bigger home. Bechen takes you on a trip around your house. Using examples from her life of moving, as well as years of experience, study, savvy and common sense, she helps the newly independent, the recently down-sized, the mobile modern family think about lifestyle in practical means that also take into account family mementoes. She goes room by room to teach us to make the most of the tiniest living areas, and creating separate areas in a one-room apartment. Have no foyer, but always dreamed of one? Bechen shows you how to do it? Miniature bathroom? Bechen gives you hints about creating a spa experience no matter the size. Using small pieces of furniture creatively, nightstands, small dressers and multi-purpose pieces are favorites, the author uses space in clever ways for storage and décor that won’t seem crowded. I appreciated the area at the end of chapters to make notes to meet my needs, as well as resources to find the materials she discusses. Using clever rhyming alliterative headings, Behen makes even downsizing from a lifetime of memories seem doable. My only quandary is that I’m short, and so uncomfortable thinking about using space vertically. Stepping stools take care of this, I know, but for aging or unsteady folks, that’s not always practical. Otherwise, Small Space Organizing is a fantastic tool for those on the go or thinking of downsizing which I’ll be happy to recommend. Babylon’s Falling by William G. Collins. I wasn't sure if this was a YA novel when I first began reading it. I was curous about WestBow publication offerings when I agreed to read it for Thomas Nelson's Booksneeze program. And, wow, all an author's fears scream at me. You'd think Thomas Nelson would have more respect for its reputation and that of its authors to let Mr. Collins' work come out looking like this. And I sympathize because I've been the victim of poor editing but at lest I didn't pay for it. As an editor I would have made sure that at least the grammar and punctuation was correct. As a historian, I cringed at the dreadful inaccuracies. As a lover of the Word, I was more than disappointed at some of the author's interpretations, such as Daniel and his friends marrying. Of course it might have happened, but there is no indication of that in Scripture. Yes, I realize this is fiction, but then at least change the name, or call it a story based on what might have occured behind the scenes in Babylon. Conclusion: Authors, beware giving your money to WestBow. Don't be that desperate to get your work in print. It won't hit fifty degrees here today, I know that. But just hearing it on the Milwaukee weather forecast made me give in to the spring cleaning urge. 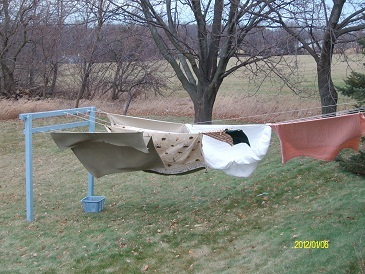 Indiana Ann's in Florida, the traitor, and can't smack me upside the proverbial head to tell me not to hang the blankets outside on the Twelfth Day of Christmas, otherwise known as January--yes, JANUARY--6th in Wisconsin. It's like saying, "let's get married on December 1 UP NORTH, darling." Yes, Andy, I mean you. But it feels good. I let the spring monster come right up to me, look me in the eye, and bow to its will. Like knowing there's been a tornado in every month (but February? Or did that happen last year?) in Wisconsin - far from Kansas. But it will smell like spring tonight. Sweet to dream by; soaking up the promise.